Wheelabrator Technologies wants to expand the landfill in Saugus. SAUGUS — Nearly every day over the past four decades, two boilers have brewed intense fires that burn 1,500 tons of trash at the incinerator that looms over Rumney Marsh Reservation, a wildlife sanctuary the state considers a critical environmental concern. The incinerator, which generates enough electricity to power 38,000 homes a day, releases a constant plume of carbon monoxide, sulfur dioxide, and nitrous oxide. It also produces a massive amount of noxious ash, which has been piled 50 feet high on an old, unlined landfill surrounded by the reservation, a haven for some 200 migratory birds, including snowy owls and upland sandpipers. Now, after 41 years of making energy from trash, the plant is approaching capacity at the 160-acre landfill, where a constant rotation of trucks dump heaps of gray, sludge-like ash. As a result, the incinerator’s owner, Wheelabrator Technologies, wants to expand the landfill, which would allow the controversial plant to continue operating. The proposal has sparked an increasingly acrimonious battle in Saugus and in neighboring communities, where residents, activists, and local officials say they’re deeply concerned about the ecological risks and potential health impact. They would prefer the plant close. She and other residents have urged the Saugus Board of Health and the state Department of Environmental Protection to reject Wheelabrator’s proposal. They worry that piling more ash in the landfill, which lacks the thick, puncture-resistant plastic that lines modern dumps, increases the risk of hazardous materials leaching into the groundwater, especially as sea levels rise. Wheelabrator officials say expanding the landfill wouldn’t present a risk to the surrounding wetlands, because the landfill uses a sophisticated groundwater protection system and is sealed off by a large barrier wall. The incinerator, originally slated to close in 1996, is one of seven left in Massachusetts, which has banned the building of similar waste-to-energy plants. Company officials insist the plant is a good neighbor and provides substantial benefits to the region, including 57 jobs, $3.4 million a year in local taxes, and a means of producing energy while diminishing the need for landfills elsewhere. If authorities reject Wheelabrator’s plan, Connolly said he expects the plant would continue operating by shipping the ash to a landfill elsewhere, which would be significantly more expensive than storing it in Saugus. Wheelabrator, based in Hampton, N.H., moves ash from its other incinerators to landfills in Shrewsbury and Putnam, Conn.
“The impact would be reflected on what we charge surrounding communities for trash disposal,” Connolly said. The plant takes about 450,000 tons of solid waste a year from nine municipalities including Saugus, Revere, and Boston. “If this plant isn’t here, where else would that waste go?” Connolly asked. Local officials say they’re ready to consider their options, and that they would prefer to see the landfill capped to make way for a solar farm. They say a solar array built on 200 acres there could power nearly twice as many homes and businesses as the incinerator, and earn more revenue for the town. They also remain deeply concerned about health consequences for residents exposed to the pollutants dispersed from the plant’s towering smokestack, noting that lead and mercury emissions can damage the central nervous system, dioxins can cause cancer, and that sulfur and nitrogen oxides can lead to acid rain. Company officials say the emissions are filtered and safe. At a meeting this month before the Saugus Board of Health, which could reject Wheelabrator’s landfill expansion, scores of residents voiced their concerns. Among them was Debra Panetta, chairwoman of the town’s Board of Selectmen, which last summer unanimously passed a resolution opposing the landfill’s expansion or the burning of waste there after the end of the year. She noted how Wheelabrator, which owns two other incinerators in Massachusetts, agreed in 2011 to pay $7.5 million to settle a state lawsuit accusing the company of breaking environmental laws. The state alleged that a broken filter at the Saugus plant allowed 8,000 gallons of ash to spill into a parking lot and nearby wetlands in 2009, and that a hole in the roof allowed ash to spew into the air. Wheelabrator was also accused of failing to notify the state in a timely fashion, as required by law, and excavating wetlands without state permission. State Representative RoseLee Vincent, a Revere Democrat, has proposed legislation that would require Wheelabrator to close the landfill by the end of the year. The report, however, found “statistically significant” rates of testicular, brain, and other nervous system cancers. “The fact of the matter is that this study is not comprehensive enough to draw the conclusion that Wheelabrator wants citizens to believe,” she said, noting that the report didn’t evaluate cancer rates in nearby Revere and Lynn. She said she also worries about increasingly powerful storm surges as sea levels rise. “It’s only a matter of time before a devastating coastal storm washes contaminants into the Saugus and Pines rivers,” she said. 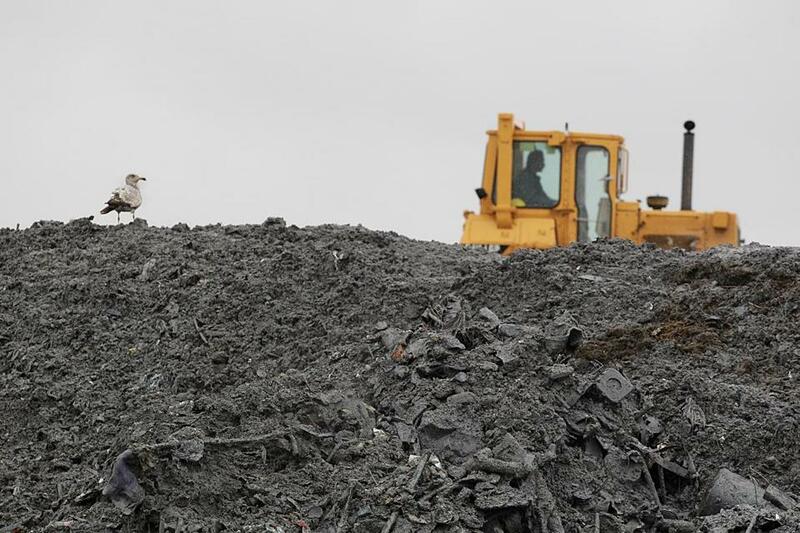 On a recent tour of the landfill, company officials pointed out owls, sandpipers, and other birds, while bulldozers nearby smoothed out mounds of ash and dirt, which were filled with bricks, the remnants of a shopping cart, and other refuse that couldn’t be incinerated. They insisted they’re confident in their safety measures, even in the event climate change produces more powerful storms. “We’re not worried,” Connolly said. The Board of Health expects to vote this summer on whether to approve the landfill expansion.